*Swim That Rock Finalist for the New England Book Award! John and Jay just completed a two week book tour visiting over a dozen schools and bookstores. Here is a very nice article in Publishers Weekly about it. When his dad goes missing in a fishing-boat accident, fourteen-year-old Jake refuses to think he may have lost his father forever. But suddenly, nothing seems certain in Jake’s future, and now his family’s diner may be repossessed by loan sharks. In Narragansett Bay, scrabbling out a living as a quahogger isn’t easy, but with the help of some local clammers, Jake is determined to work hard and earn enough money to ensure his family’s security and save the diner in time. 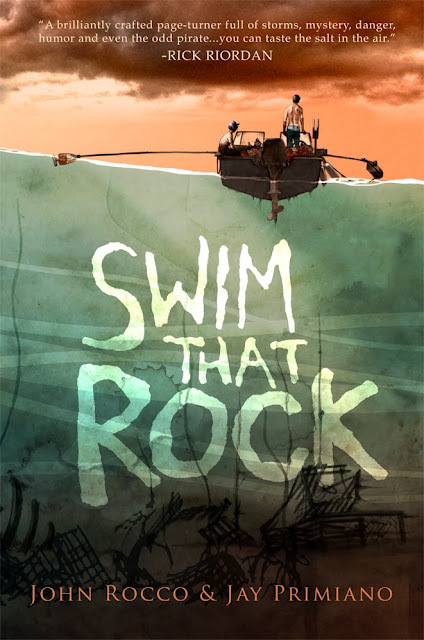 Told with cinematic suspense and a true compassion for the characters,Swim That Rock is a fast-paced coming-of-age story that beautifully and evocatively captures the essence of coastal Rhode Island life, the struggles of blue-collar family dynamics, and the dreams of one boy to come into his own.